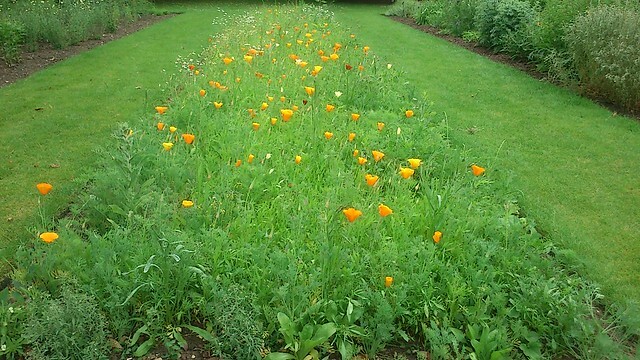 On Saturday I called in at Oxford Botanic Gardens. I've had a year's pass now and it's been definitely worth it—we even made a trip out to the Harcourt Arboretum a few weeks back—but as we're leaving the county I'm loath to renew once August 11th rolls around. So in a way this was my farewell trip, although I tried not to think of it that way at the time. 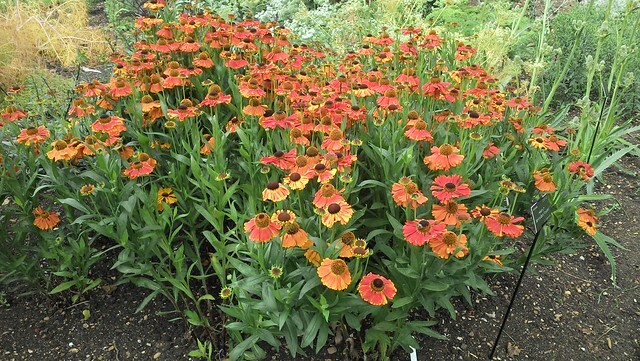 July is a month of burgeoning foliage anyway, and the end of July sees the resurgence of flowers along with it, especially hot reds and oranges. 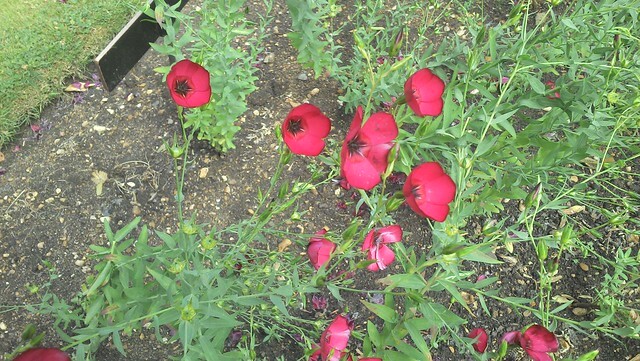 Even the flax had decided to put on a show of red! 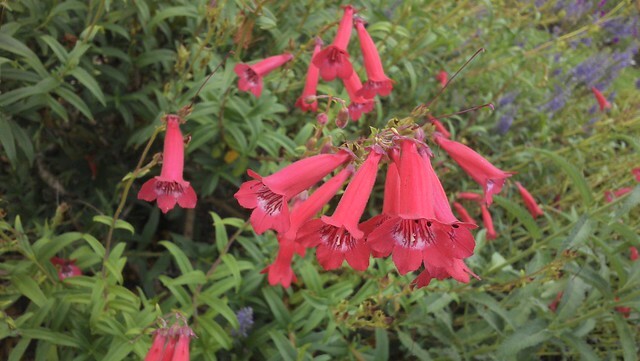 Penstemon hartwegii, perky and interested in everything, like a summer daffodil. 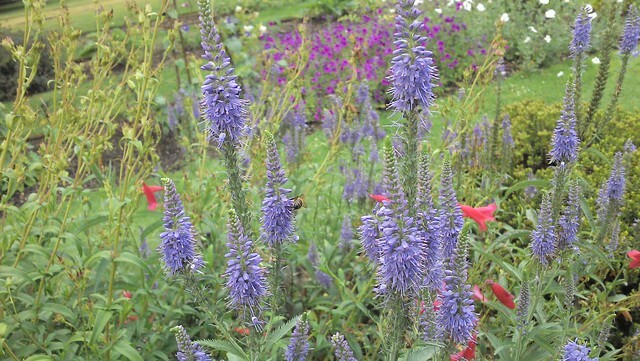 Veronica grandis with some stray P. hartwegii butting in to spice up the lilac colours. 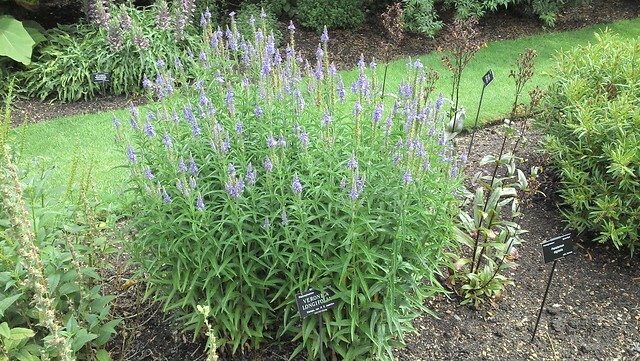 V. longifolia on its own, looking lovely but I'm hard pressed to work out the difference between it and V. grandis! 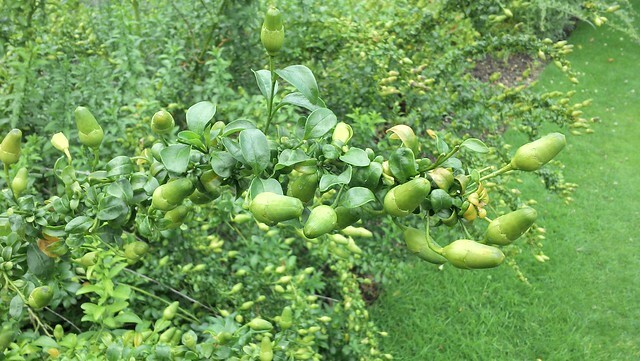 Vestia foetida's weird acorn-like fruit: click for a link to view the whole shrub. 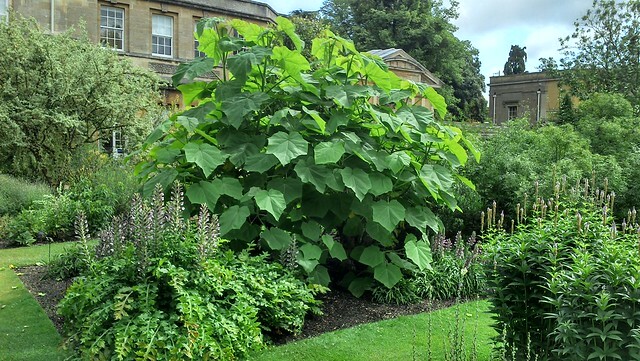 A beefy, boisterous Paulownia tomentosa overshadowing other Lamiales like Acanthus. 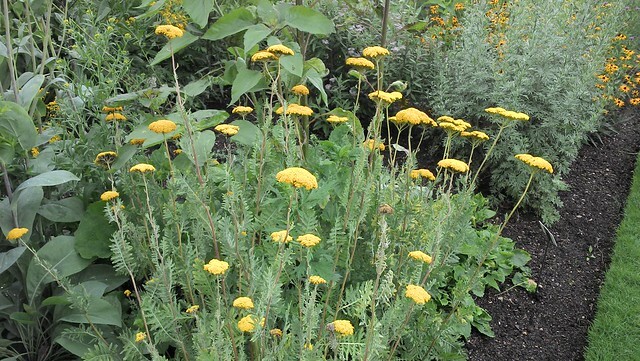 Achillea "Pretty Belinda", with some Heleniums in the background. 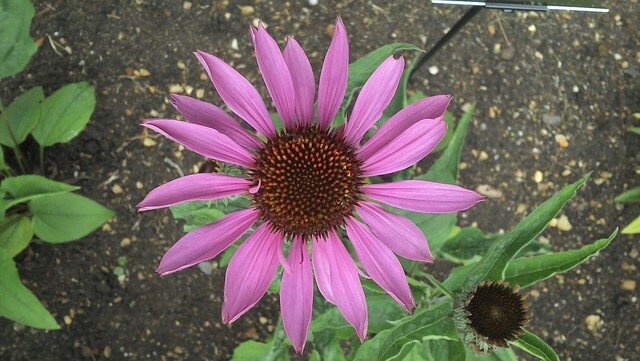 Echinacea purpurea "Magnus": and it certainly was! A good 20-25cm across. Sad, but also some testament to the landscaping skills of the garden staff. It'll be interesting to come back one day and see what they've done with this space. 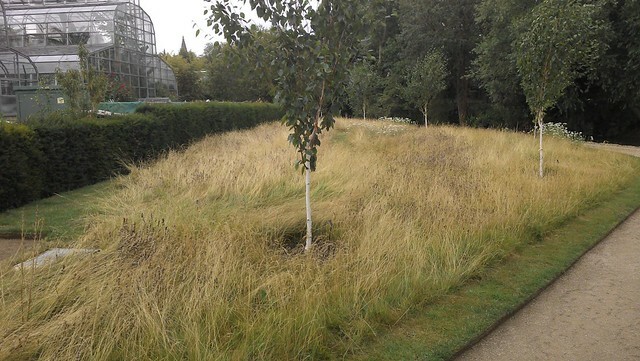 Grass border with repeated Betula utilis var. 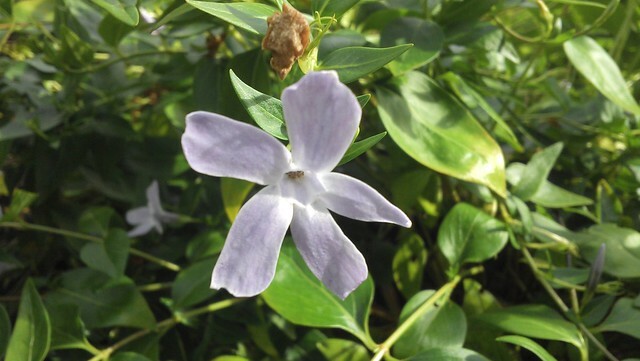 Jacquemontii "Silver Shadow". There are paths and a small clearing cut in the undergrowth, leading to the a gate to the university researchers' private area. 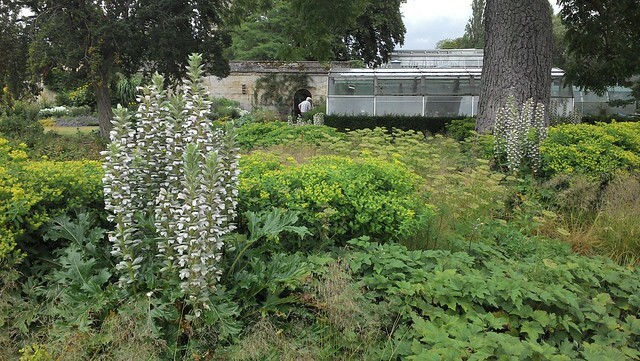 I really liked this combination planting of Euphorbia wallichii clouds punctuated by spires of Acanthus "Rue Ledan". 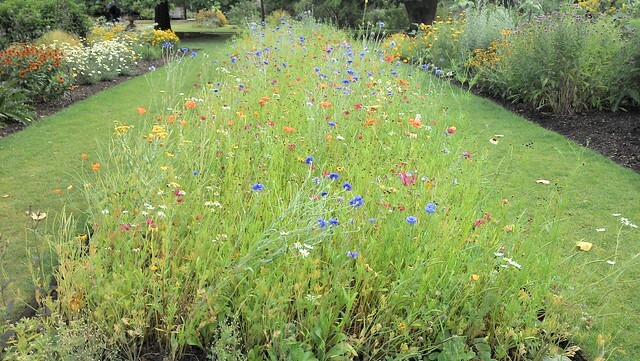 The Merton borders, planted as an experiment in drought-hardy perennials. This is the time of year for them to really let rip, and they were certainly doing that. 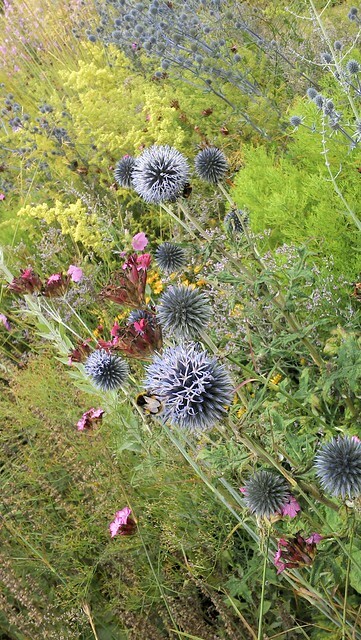 Close-up of the Merton borders: Eryngium planum with (possibly) a salvia and little yellow sunshines of Haplocarpha scaposa. 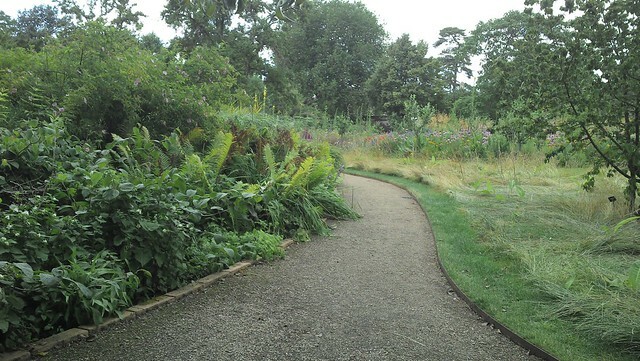 A path marks an isoclimate between the dry Merton borders and the wet borders around the bog garden. A shame the sun went in! 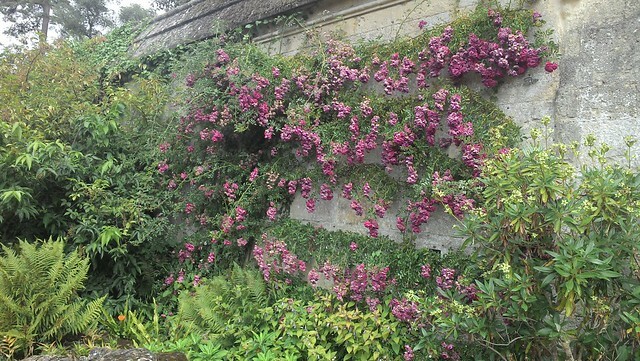 A single Rosa wichuraiana covers this entire wall by the rockery in tiers. South-facing and utterly baked, it must love it here. Clouds gathered a couple of times, and so I spent a good while in the glasshouses too. 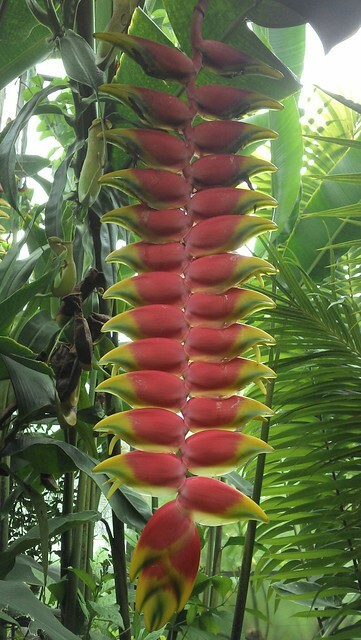 Heliconia prostrata? It looks a bit like a Musa but that was the label near its trunk. There was what might have been another one nearby. 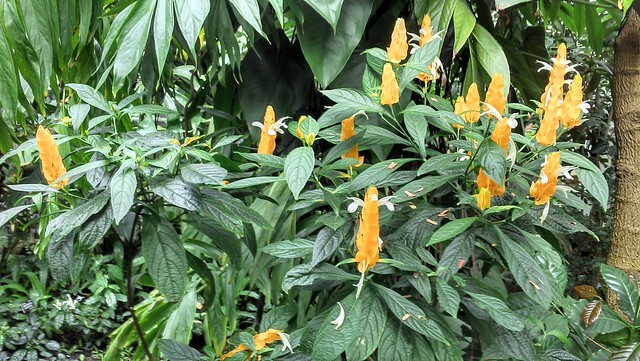 Pachystachys lutea. I hope I'll be forgiven for calling this a "Minion tree"...! Ochna serrulata. 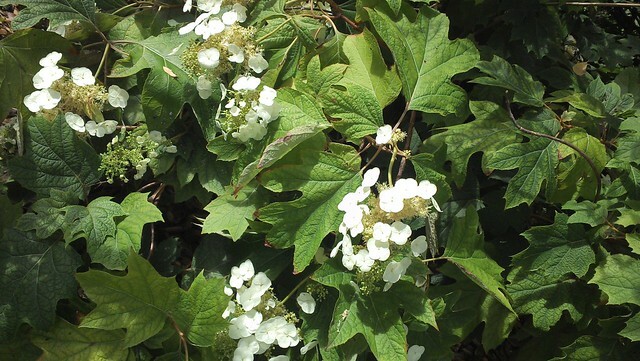 Which I like to think of as the arch-enemy of P. lutea. 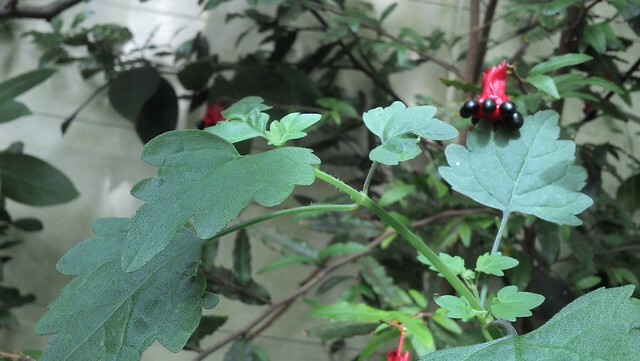 By this point I think the closeness of the atmosphere in the glasshouses was getting to me. 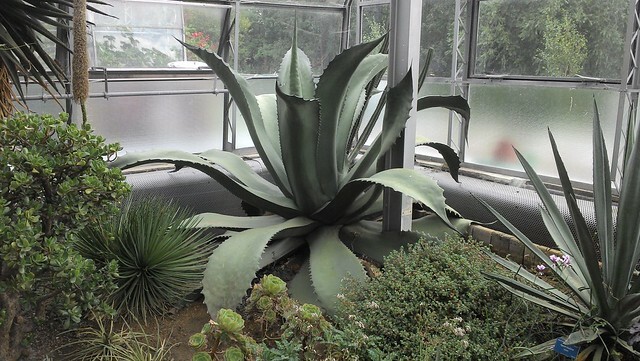 A huge Agave tequilana, looking kind of like a louche, sprawling hangover. 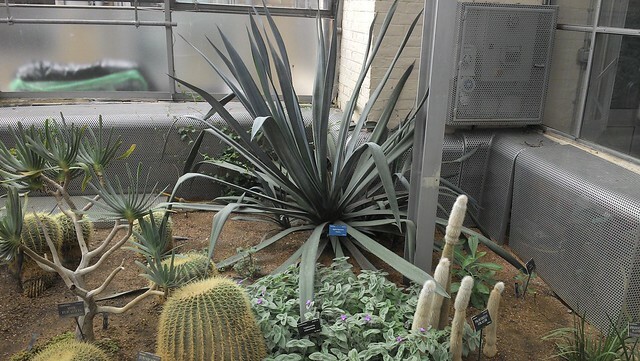 Agave ferox, lolling fatly in the heat of the depopulated cactus room, like it just ate the previous visitors. But you're all right: it's full. Tillandsia xerographica, inhabiting a Cereus jamacaru. 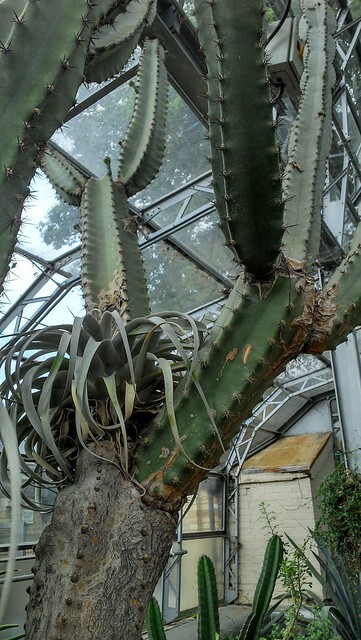 As an epiphyte, T. xerographica gets its nutrients from the air, and so isn't parasitic on the Cereus. I wandered around quite a lot, but hopefully I've pulled together the above coherently. 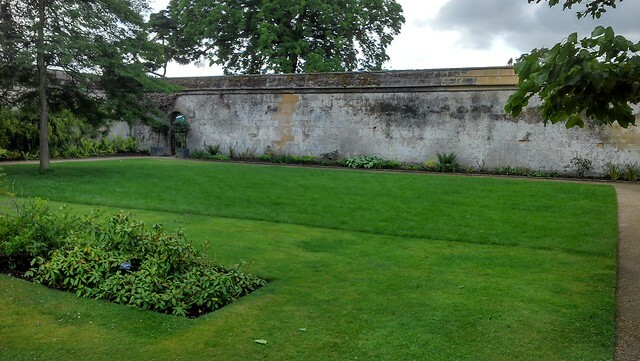 Oxford's Botanic Gardens are worth a visit almost any time of the year: even in winter, they've got exhibitions, evergreens and the glasshouses. 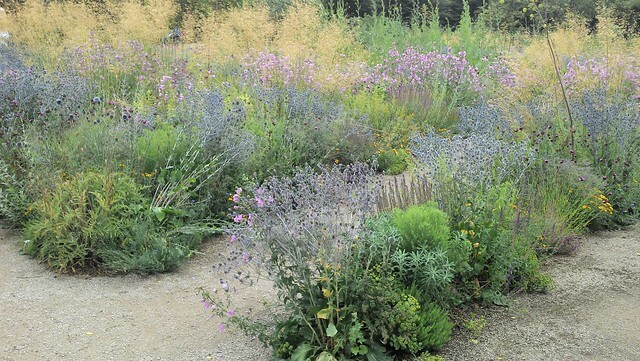 Having been there some half a dozen times in the past twelve months I really feel like, while I don't know every plant, or even every house or border, I can enjoy it like a favourite piece of music, well but differently played every time. OBG, I will miss you. 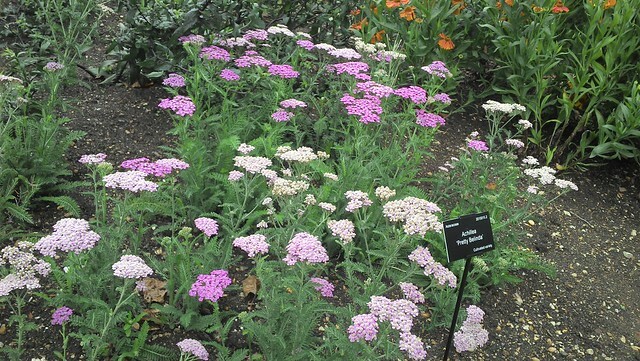 But "life is like a garden, and perfect moments can be had and not preserved, except in memory." Time for others to have those moments for themselves. Farewell!